Love to spread the word about AMBOSS? Now, for a limited time, you’ll be rewarded for it! All you have to do is give your friends 15 days of unlimited access to AMBOSS through the special link we give you. 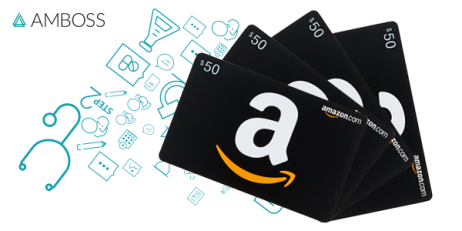 For every 5 friends that register through the link and answer 30 Qbank questions or more during their trial period, you’ll get a $50 Amazon Gift Card. * You can find your personalized link right from your AMBOSS dashboard. You have until July 31st to share your referral link. We’ll email you with a special code covering all the months you’ve earned. Have questions? Email us at hello@amboss.com. *Offer is limited to $200. If link is used to create invalid accounts, some restrictions may apply. Campaign will end on July 31, 2018 at 11:59 PM EST. The referee does not have to make a purchase to count toward campaign. Amazon Gift Cards will be sent electronically via email shortly after August 15, 2018.